Call us today for expert locksmith service! 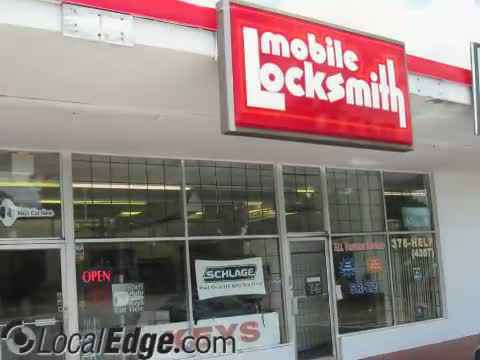 Mobile Locksmith on Archer Road in Gainesville, FL has been serving the greater Alachua County area for over 30 years. Whether it's car lockouts, keys locked in your car, or just keys and locks for all your needs, John Blackburn of Mobile Locksmith will take care of all your needs. We serve both commercial or residential customers - call 378-0870 anytime, anywhere. We won't leave you locked out! When it comes to locks and security, people in Gainesville trust out locksmith service. That's because we've proven, over the decades we've been in business, that not only are we good at what we do, but we're fast, too. If you're dealing with an emergency like car lockouts, you need a mobile locksmith to get to your promptly so that you can get your life back to normal faster. And that's exactly what our 24-hour locksmith service does. No matter when you need us, we'll be there. And if you need a new set of keys made, Mobile Locksmith is your go-to. Need New Keys Made for Your Home? Call Us Today! Our experienced experts can take care of your issue with uncommon care, whether it be with your vehicle, your home or your business. Whether it's something as simple as car lockouts to something more complex like the installation of high security equipment, we can handle it. Our locksmith service has a reputation for customer satisfaction across the board. Our technicians are up-to-date on all of the most innovative and cutting edge services the industry has to offer, and we're proud to bring that knowledge to the Gainesville, FL area. Whether you are locked out of your car or home, you can be saved by Blackburn & Son Mobile Locksmith. We operate in nearly every neighborhood of Gainesville, FL. So if you need keys made near you in a hurry, call us! If you cant find your house keys and believe they were stolen from you, don’t panic, our professionals will change the locks the same day and have new keys made for you in no time! At Mobile Locksmith, we strive to offer locksmith service that is both highly professional and widely affordable. Our trained technicians, equipped with modern equipment, are ready to fulfill all of your locksmith needs. Whether you need keys made, or to be let back in to you vehicle after a car lockout, we are here for you 24 hours a day, 7 days a week. Our locksmiths know their way around all kinds of keys and locks? Whether you've been locked out of your car, or want to outfit your home or business with high-tech security, we can help. We're on call 24 hours a day to deal with your lock outs, and you can have your locks rekeyed with us to boot. We even install computerized keys and access control door locks.